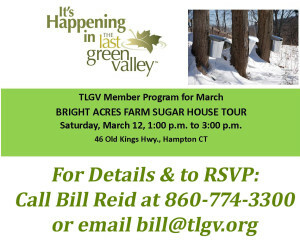 Join Richard Schenk and Judy Wilson for a tour of their sugarhouse and sugar bush. Learn about the history of maple syrup making, from the techniques used by Native American’s through the use of today’s latest technology to produce this healthy, natural sweetener. They will demonstrate the various ways to collect sap from old fashioned buckets to the latest in tubing and folks will have a chance to tap a tree. Visitors will learn what makes sap “flow” and how important the weather is too sugar makers. We will share our personal experiences of growing from a back yard hobby to a small fledgling operation. We’ll then visit Bright Acres Farm Sugarhouse and if the weather is cooperating and they have sap to boil, we will see firsthand how sap becomes maple syrup. Their sugarhouse is fully operational and their own brand of maple syrup will be available for sale for those interested in purchasing it. Following the tour we’ll enjoy warm maple syrup served on vanilla ice cream. Richard and Judy both work for the CT Department of Energy and Environmental Protection; Richard is a Fire Control Officer for the Forestry Division and Judy is a Wildlife Biologist with the Wildlife Division. To RSVP for this program, please contact Bill Reid at 860-774-3300 or by e-mail at bill@tlgv.org. Details: Saturday, March 12, 2016, 1:00 p.m. – 3:00 p.m. Please dress for the outdoors and wear boots! ← Mystery Member Meanders in The Last Green Valley! March…somewhere in Thompson, CT!